INDLINE is a Rich Media Communication Platform that allows you to communicate with anyone, anytime, anywhere using the easiest & latest communication way as well as a tool in supporting your daily productivities. 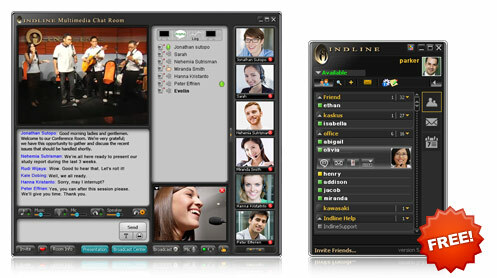 Indline Instant Messaging allows you to have a small group conference with multi video & multi voice simultaneously. Indline Instant messaging exceeds the standard features of other IMs. 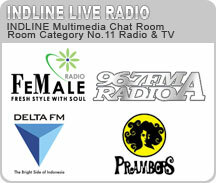 Indline Multimedia Conference / Chat Room is build for hundreds or even thousands of people to interact simultaneously. You can broadcast video files with a crispy stereo sound. Make your own music & video playlist or slide presentation. Meanwhile you can view several cameras or videos from other participants on the same time. A great tool for companies to do online meetings, presentations, lives broadcasting. Saving your time & travel cost. INDLINE Multimedia Conference / Chat Room is an embryo of a true IPTV. Indline Multimedia Mail equipped with a full word processing capability and it simplify for you to use stationary. Or just paste a video clip – paste music or pictures, all into one page of your email. Other Indline user will receive your mail as it is. No more need to download attachments. The multimedia mail application allows you to manage several pop mails addresses. You can also send a Video mail, Voice mail and Text messages (SMS). Very useful for creating a news letter. Experience Indline and let this ultimate multimedia application change the way you work, learn and play.